The recently published article "Thiol, Disulfide, and Trisulfide Complexes of Ru Porphyrins: Potential Models for Iron-Sulfur Bonds in Heme-Proteins" from Dr. James and coworkers, will be highlighted in JACS Spotlights, a new feature introduced to the Journal of the American Chemical Society in 2012. JACS Spotlights are intended to make JACS research more accessible to the broader community. Brief summaries by science writers explain the impact and significance of the research findings. 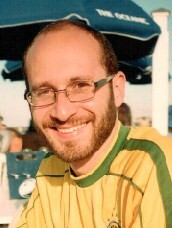 Dr. James’ former PhD student, Julio Reboucas (now at the Federal University of Paraiba in Brazil), pictured above, played the key role in this research. "Simplifying Iron with Ruthenium - Heme proteins are involved in important biological processes, including oxygen transport in blood and catalysis of oxidation reactions. These proteins' heme groups consist of an iron atom bound in the center of a nitrogen-containing ring structure called a porphyrin. The iron also binds to sulfur atoms in the protein, and characterizing these interactions will contribute to a clearer understanding of heme protein function. However, reactions performed by heme proteins can be accompanied by complex changes in the chemical and electronic nature of the iron in the heme group, complicating the investigation of the iro­­n-sulfur interactions in the proteins. Now, Brian James and coworkers, particularly his former PhD student Julio Reboucas, report the synthesis and characterization of 32 novel porphyrin complexes containing ruthenium instead of iron as models for exploring iron-sulfur interactions. Like iron, ruthenium binds to sulfur, but ruthenium does not experience the same complex chemical changes as does iron. Structural analysis methods such as X-ray crystallography and nuclear magnetic resonance spectroscopy were used to characterize the interactions between various sulfur-containing molecules and ruthenium porphyrins. Original article: "Thiol, Disulfide, and Trisulfide Complexes of Ru Porphyrins: Potential Models for Iron-Sulfur Bonds in Heme-Proteins" J. Am. Chem. Soc., 2012, 134 (7), pp 3555–3570.